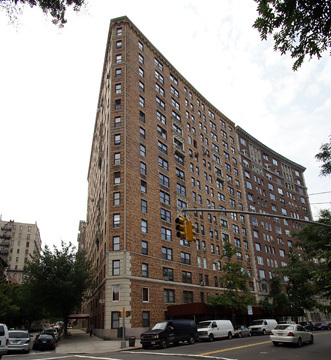 This very attractive, orange-and-brown-brick, 16-story rental apartment building at 98 Riverside Drive has a gentle curve along Riverside Drive and a sidestreet entrance at 320 West 82nd Street. The building has a one-window-wide chamfer at the Riverside Drive corner where it also has a three-story, rusticated limestone quoin. The building has stringcourses at the third and fourth and fourteenth floors and scalloped cornice as well as a few scalloped window lintels. The buiding, which permits protruding air conditioners, was designed by George F. Pelham in 1929. In 2008, it was acquired by Northbrook Properties LLC, of which Maurice Mann, the president of Mann Realty Associates, and a co-owner of the Apthorp apartment building (see The City Review article), from AVJ Realty, a firm owned by the heirs of the Racolin family. 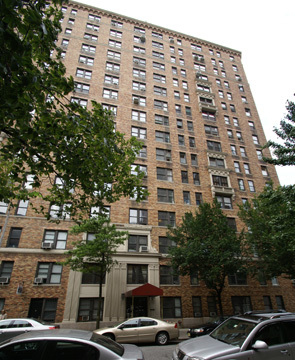 It was part of an acquisition of nine buildings for more than $300 million, according to an article by Bradley Hope in January 17, 2008 edition of The New York Sun. At the time of the sale, about 20 to 25 percent of the building's units were "market-rate." The article quoted Karol Stonger, the president of the building's tenant association as stating that "people leave this builing feet first." The article indicated that Mendel Racolin "was a Russian dentist who entered into the real estate bnuinsess in about 1930, according to an obituary in The New York Times on March 31, 1950" when he died at 69. The New York Times ran an article in its May 22, 2008 edition by Lily Koppel that was the first chapter of her book published by Harper Collins entitled "The Red Leather Diary." The diary was a gift to Florence Wolfson, a resident in the building, on her 14th birthday and she made entries for five years. The article described the diarist as a "strong and headstrong New York teenager" and noted that the building's management decided to clear out the buiding's storage area in October 2003. Koppel wrote that the building was "set like a misty castle overlooking leafy Riverside Park and the Hudson River and the building felt like a hidden universe awaiting discovery." "Under the maroon awning, I entered the red marble lobby, pockmarked with age like the face of the moon. Passing an old framed print of a gondola gliding under Venice's Bridge of Sighs,the early August evening light filtered through stained-gass windows illuminating a young gallant displaying a jeweled coat of arms, with a dagger stuck in his belt. He was carrying a locked treasure chest. ...The building seemed to have an artistic soul." The building has a doorman but no garage, no roof deck, no balconies, not fitness center and no sidewalk landscaping. It is not far from Zabar's.